**This post was originally posted on the Spatula Underground. This past weekend, my roommate Cassie, Christopher, and I went on an epic trip to Ikea. In need of random furnishings, rugs, and accessories for our cozy new home, we decided to borrow a coworkers van, get up early, and go to yuppy mecca, pay homage to the scandinavian demigods who create furniture that can be built and broken down with great efficiency, and come home to make our lovely home even lovelier. It was a good plan. If only things had run so smoothly. On the way there, driving on the highway, Sassie Cassie approached stopped traffic but was not able to slow down. "Omigod you guys, the brakes! the brakes are not working!" She immediately swerved off an exit and pulled the emergency break. She handled it like a champ, but we were definitely shaken up. Nervous laughter, a detour back onto the highway, a tenuous exit and we were finally at Ikea all in one piece. Nothing like facing the hooded face and shiny sickle of black death to get you in the mood for some crispy chips that affirm that you are indeed still alive with every crunchy bite. So where else did we go but the Ikea food court? Is there anything better than commercial scandinavian food? No, there isn't. 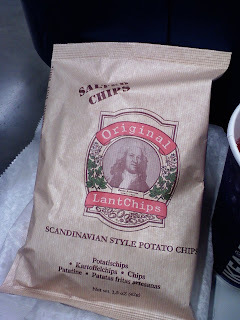 Behold, I give you Ikea's LantChips. Thankfully, I didn't have to use a cute little wrench to put this bag together. The flavor is spot on, not too salted, just greasy enough. 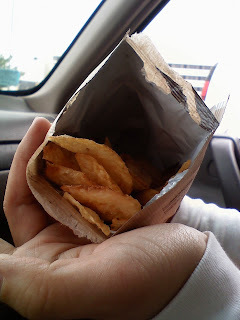 The texture of the chips are much like kettle-cooked chips-- thick skin, very potato-ey, but not as greasy or heavy as American chips. As a person of the Asian persuasion, I was grateful for the mild flavor. Eaten with a big cup of Lingonberry juice on ice, it was, HAUW YOU SAY ... PERFEKT!